There are several benefits of setting up a VPN for your router. Top among them is the all-round protection. Once you have set-up a VPN on your router, any devices connected via that router enjoy the protection of a VPN. Typically, VPN companies limit the number of devices allowed for a single account. Only one or two VPN companies allow unlimited device connections. With a router VPN, you can connect as many devices as you like. The only downside is you may end up overwhelming the bandwidth and slowing down your connection. Ever wanted to have VPN on your smart TV? Well, this is not exactly something many VPN companies offer. Except Express VPN’s MediaStreamer DNS, you will be hard-pressed to find a VPN to support other devices like Roku, Xbox One, PlayStation, Apple TV, and Smart TV among other content streaming consoles. Having a VPN on your router ensures the VPN protects all the media you stream or download via the router. When using typical VPN Apps on your various devices, you are required to log in to each device separately every time you want to access the internet through the VPN. Whereas having a VPN on your router needs a single login process, ever. 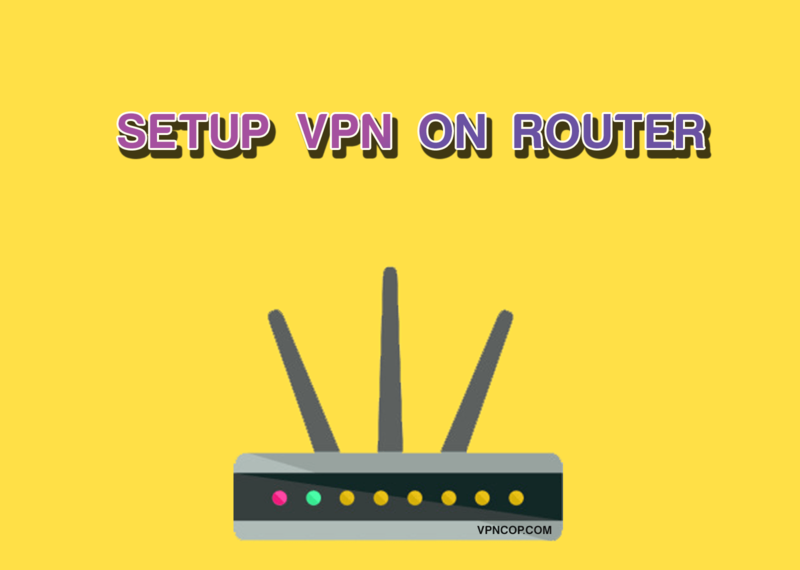 The VPN along with the router will provide somewhat of a protected Wi-Fi connection for all devices browsing under the router internet. As we celebrate the benefits of having a VPN on your router, we must also consider the drawbacks. A VPN service by itself tends to slow internet speeds. By extension, having a VPN on your router may significantly slow down your connection. However, it’s worth mentioning that your connection speed depends on more than your VPN provider, it also depends on your ISP, the number of devices you connect, and your bandwidth allocation. The cost of connecting your router to a VPN provider may be higher than you anticipate. Router VPNs are often expensive and more likely than not, you will have to purchase a new router to enable the connection. It is possible to upgrade your router to one that can take VPN generally by purchasing some advanced firmware. But typically, common routers can’t take an upgrade and its best you buy a new one. When using normal VPNs, switching servers is as easy as clicking a button. Unfortunately, for router VPNs it's not quite as easy. You may discover that you are stuck with the same server you selected during the initial setup. The process of switching a server may involve plenty of steps including reconfiguring the router interface. As usual, VPN providers are working on ways to improve router VPNs including the ability to quickly switch between servers, but currently, we are not there yet. The primary role of a VPN is to keep your traffic safe. Often it may need to block any traffic that does not meet the safety criteria. This same diligence may work against you when you use less tech-savvy devices like a baby monitor. You may not be able to access your home network or communicate with other devices as easily as you used to especially when you are outside your home. Now that we are clear on the merits and demerits of a VPN on your router, it is time to choose whether or not you feel the need for a VPN on your router. With this question comes the issue of whether you need a new router or can you use the current one? As earlier stated, not all routers can work with a VPN. 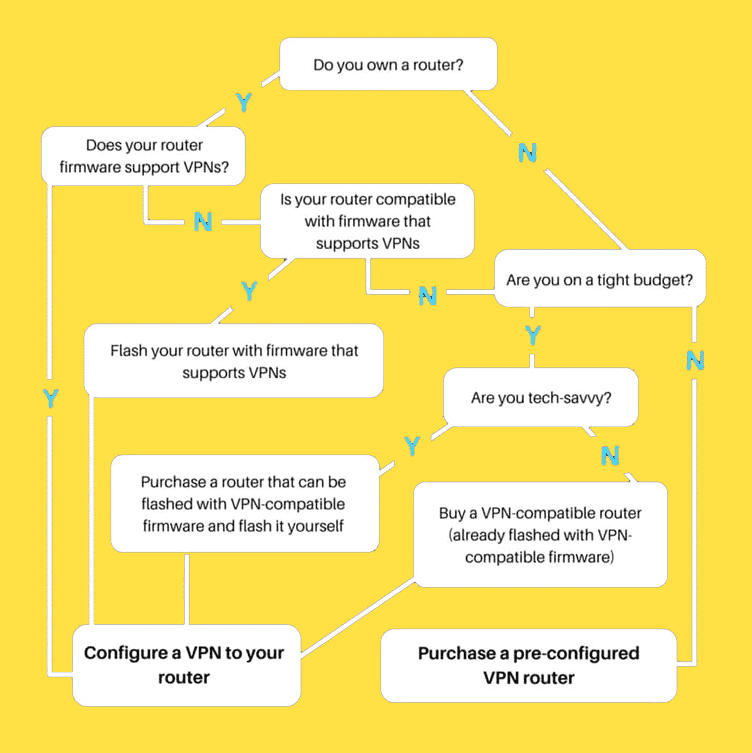 So, essentially choosing a VPN router is choosing a router that is compatible with a VPN App. As far as VPN routers go, there are two ways to acquire one; you can buy a pre-configured router with in-built VPN capabilities or perform an upgrade on your router to accept VPN using a process commonly called ‘Flashing.’ So, how do you choose? The table below will help in the decision process. Now that you are clear on which way to go, let's explore the types of VPN routers you can go with. You have three options as far as router setups that work with VPNs are concerned; a pre-configured router, a VPN-compatible router, or a ‘Flashed’ router. Be warned that pre-configured or ‘pre-flashed’ routers are costly. But the cost is well worth it because it saves you the headache of flashing your router yourself and finding the right firmware to go with it. Pre-configured routers are not easy to find in the market. There is no variety of vendors, and there is also a big chance you may run into a scam. The only recognized and trusted vendors of pre-flashed routers are Flashrouters. Wherefore, you may need to spend even more on your purchase if you will purchase online thanks to shipping fees. You may also encounter a real problem when you need to return a faulty device. Still, pre-configured routers are a good choice since they come complete with advanced performance features and an encrypted plug-and-play. You can as well request a pre-flashed router prepared for your choice of VPN. These are the most comfortable option when it comes to selecting a VPN router. VPN-compatible routers come pre-installed with VPN-compatible firmware. Wherefore, you can straight away connect to most VPNs and enjoy encrypted browsing without having to change any settings or connect this router to any other router. It is, however, imperative that you check the type of protocols that work with your router. Although most VPN-compatible routers default to OpenVPN protocol, always ensure you check before making your purchase. Our recommendation is the OpenVPN protocol. It is the most popular, most secure protocol in the market and it works with a majority of VPN providers. First off, flashing your router with new VPN-compatible firmware will only work if you are techy. If you do not know your way around a router and have the working knowledge of technology, consider any of the two options above. That being said, this is the cheapest way to get VPN on your router. However, as earlier stated, it is no easy feat. You will need to do some research on the subject and ascertain that you are up to the task. DD-WRT is an open source Linux-based firmware developed for wireless routers and access points. It was just meant for Linksys WRT54G series. Now it works on a wide variety of devices as third-party firmware meant to replace default restrictive firmware with custom, flexible, firmware with additional features and advanced capabilities. DD-WRT is more popular and more versatile than Tomato. It is compatible with upwards of 80 router models including newer brands like D-Link, TP-Link, and Tenda among others. Here are the few ways installing DD-WRT will improve your router. Prevents and controls network overloads and bandwidth hogging by use of the Quality of Service feature. Offers IPv6 support especially because IPv4 addresses are quickly running out. Facilitates port forwarding which will enable you to remotely access your device. Grants access to multiple source access-control including WiFiDog, ChilliSpot, and HotSpot system to mention a few. Enables a formidable firewall built on iptables firewalls construction. This feature allows you to edit various aspects of the DD-WRT interface. Increases functionality and extensions and in particular external USB connections. Enhances DNS controls, for example, availing the DNSmasq attribute which not only enables you to find DNS host-names but also simplifies DNS configuration. This feature also presents additional DNS Support particularly from DynDNS, No-IP, and TZo among others. DD-WRT protocols ensure that your access port is only seen by the client which boosts data security especially for routers used by multiple clients. Tomato, like DD-WRT, is a Linux-based firmware for wireless routers. This firmware was created to replace insufficient firmware in wireless routers and expand their capabilities. Tomato Firmware does not have the same range that DD-WRT has. It mainly works with older versions of Linksys WRT54G family that run on Linux. This means that if your router runs any Linksys WRT54G later than version 4, Tomato Firmware will not suffice. Other Linksys routers compatible with Tomato Firmware include WRT54GS, WRT54GL, and WRTSL54GS. Tomato Firmware also works with Broadcom chipsets and other brands of wireless routers including Asus, Netgear WNR5300L, and Buffalo AirStation. It features Tomato USB open source firmware or Tomato Shibby which improves your router by increasing network coverage, monitoring your bandwidth and enabling the Quality of Service feature which prevents network overload and bandwidth hogging. Beware that Tomato Firmware, unlike DD-WRT is only partially free. Also, it comes in only one primary version and one alternate version specifically made for Buffalo WHR-G125 router. Presents an adjustable antenna signal transmission system that you can increase if need be. Has a Quality of Service (QoS) feature which means you can set rules and give priority to certain traffic. Avails Virtual Local Area Network (VLAN) support, Network Address Translation (NAT) support, as well as software Q and A for the SD-Card hardware modification. You can enable Access Restriction. This is a special attribute that you can employ to restrict other users from accessing certain websites. You can monitor your bandwidth thanks to the performance graphs and statistics. OpenWrt firmware is the oldest in our bunch. It is an embedded Linux-based Operating System used to redistribute network to embedded devices. OpenWrt is open source code and a merge between the older version of OpenWrt and Lede. OpenWrt is a genuinely open source which means it’s a writeable root file system plus you can install additional software as well as modify the existing one. To this end, OpenWrt can replace your router’s source firmware and work for other devices including pocket computers, laptops, smartphones, and residential gateways. OpenWrt has loads of features. Perhaps the only downside, which in our opinion isn’t a disadvantage is the fact that it is completely free and only supports devices that take free software. The reason why this is a disadvantage is most devices take free firmware but require non-free or partially free binary blobs and drivers. You can create special guest network away from your main network. This is great for security and even allows you to control the bandwidth. OpenWrt can function as a Bit torrent client enabling you to download securely plus enjoy the perks including an integrated USB port and an attached USB storage device. It offers the all-important Quality of Service (QoS) feature which means you, as the admin, can choose which traffic gets priority. Supports and runs multiple server software including the Bit torrent tracker, web server, as well as the IRC server. You can monitor and analyze all the traffic going through your network including engaging the tcpdump to register the logs then analyze with Wireshark. Sabai OS is a Tomato-based operating system created to replace source firmware in routers. It is proprietary software from Sabai Technologies which not only works for their routers but can also be installed in other brands of routers. Sabai OS is quite simple. You will love its easy to use User Interface with loads of advanced features like a Kill Switch and Gateways. Sabai OS works with both OpenVPN and PPTP protocols which makes it compatible with most VPN providers. Even though Sabai OS is open source and free, the technical support isn’t. If you choose Sabai OS, you have to engage its technical support which is pretty comprehensive. You will get telephone support, email, remote technical assistance as well as tons of useful guides and videos. Each purchase awards you a 1-year hardware warranty, 1-year direct technical support, a 90-day customer satisfaction guarantee, and Sabai OS software updates for as long as you need them. Sabai OS offers selective routing, which in a way resembles split tunneling. It works by allowing you to select which devices to connect through a VPN and which tools to connect directly to the Local Area Network (LAN). Great advanced features including wireless bridging, Quality of Service, port forwarding, and DMZ among others. It has a Gateway feature which allows you to choose how different devices within your network are routed. Has a Kill Switch and a simple user-friendly interface which makes it easy to work with. That being said, Sabai OS is straightforward and does not feature any additional aspects which makes it a bit no-nonsense. Sabai OS puts out regular security upgrades which are a huge plus. As earlier stated, there are VPN-compatible routers, pre-flashed routers, and routers that you have to configure manually. VPN-compatible routers come already built-in with the firmware of a particular VPN provider. Depending on your choice of VPN, you can purchase their VPN-compatible router and enjoy stress-free configuration and money-back guarantee. Most VPN companies are end-up outsourcing the process of configuring a router with their firmware to Flashrouters and Sabai companies. There is, however, ExpressVPN who went all in and created their firmware and ExpressVPN pre-configured routers on sale from their website and on Flashrouters as well. As far as VPN-compatible router brands, aside from ExpressVPN, you have three more options; Asus, Synology, and Buffalo. If you choose to go with Flashrouters, you can go for the easiest option, the pre-flashed routers already configured with VPN firmware. 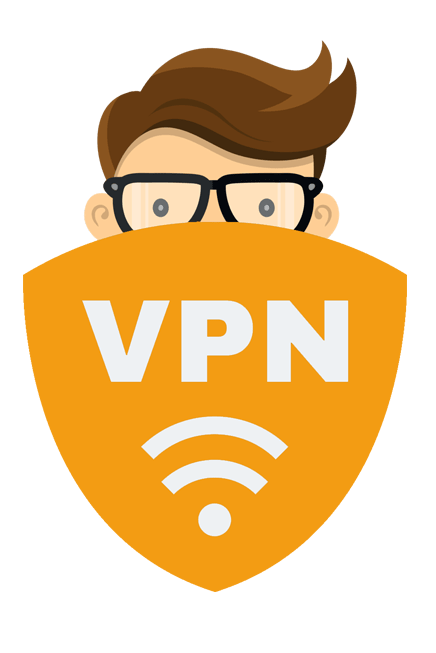 You can choose VPN routers from all the major VPN providers including ExpressVPN, NordVPN, IPVanish VPN, HideMyAss VPN, Windscribe VPN, Private Internet Access VPN, SaferVPN, Buffered VPN, and PureVPN. This means that you have to choose your ideal VPN beforehand so you can get a router configured with the firmware of that particular VPN service provider. Alternatively, go for their pre-flashed routers that do not carry firmware for any particular VPN provider, just general VPN-compatible software. This way, you can choose a VPN provider later and configure your router through a few simple steps. Flashrouters usually offer a 30-day customer satisfaction guarantee and a 90-day warranty which can be extended for some additional fees. You will also get Email Support for 3 months extendable to a year for a small additional fee. Sabai technologies, like Flashrouters, offer pre-configured routers. The main difference is Sabai Technology offers routers with their in-house software, the Sabai OS based on Tomato firmware. You can purchase the Sabai pre-configured routers as they are or you can request one with pre-configuration for a particular VPN provider. If you really prefer DD-WRT over Sabai OS, Sabai routers are carrying DD-WRT firmware though they are not VPN pre-configured. With Sabai Technologies you will enjoy a 90-day customer satisfaction guarantee and a 1-year hardware warranty. Just because a company purports to provide VPN-compatible routers, it does not mean that they are true to their word. There are plenty of Router brands in the market, but only a few have stood the test of time. Here are the top brands to consider. Essentially what you want is a router that can support the OpenVPN protocol and DD-WRT firmware or can be configured to support it. Other protocols like IKEv2 and the older L2TP/IPSec are irrelevant in this case, although more often than not, you will come across a router that recommends PPTP. Our recommendation is OpenVPN protocol. PPTP, while doable, is riddled with security weaknesses that should be a matter of concern to you. Asus routers are top on our list and the best value for money. Depending on how much you want to spend, you can get cheaper or high-end Asus router like Asus RT-AC86U, churning out up to 150Mbps even when running with a VPN. We have chosen to use ExpressVPN as our VPN provider mainly because it's among the best VPN choices in the market and it works on a broad range of devices. Select “Manual Configuration” and then choose “OpenVPN.” This will subsequently download “. ovpn” file into your device. Note that you can select and download multiple “.ovpn” files for all the locations you would like to use. Ensure you have your username and password handy. You will need it pretty soon. Open your router configuration table. Get the address from the browser and your Asus router control panel. The address should be 192.168.0.1, 192.168.1.1, or 192.168.1.254 by default. The ASUSWRT interface will be generated. Sign in as Admin on the username and Admin as the password unless it has been changed. Username: The username and password we mentioned earlier. Import .ovpn file: import the .ovpn files already downloaded. Click on OK and then ACTIVATE to power up the VPN. Remember to check if the VPN is working by checking if your IP has changed. If you notice that the VPN has not activated, repeat the process but instead use a different .ovpn location file to activate. You may be wondering which is the best VPN for your router, well, we have compiled a list of our top three. As earlier stated, ExpressVPN is the only VPN provider who has taken routers seriously. So much so, they created a source firmware for their routers, and that is why they are the number one choice. You will be happy to know that routers with the ExpressVPN firmware also work with DD-WRT, Tomato, and OpenWrt. All the robustness of ExpressVPN offered to typical VPN-compatible devices like PCs, phones, and tablets will be extended to your router. With a network of servers across over 100 countries, enjoy streaming, downloading and browsing anonymously without lagging or buffing. IPVanish VPN makes our list because it is a fan-favorite for Kodi users. On top of offering standard encryption with a Kill Switch and other awesome advanced features, IPVanish VPN has the highest number of device limit which is 10. You will love the easy install and if you buy a router already pre-flashed with the IPVanish VPN software, all you need is a few minutes to get connected. IPVanish VPN does not have Live Chat but you will have sufficient email support and numerous guides to help you along. NordVPN is not only a formidable VPN provider for general devices, it works wonders for routers too. With an extensive network of over 4,500 servers, NordVPN you will be spoilt for choice. Get NordVPN pre-configured routers or have your router “flashed” with the NordVPN firmware. NordVPN is among the very few VPN providers who can work with OpenWrt. 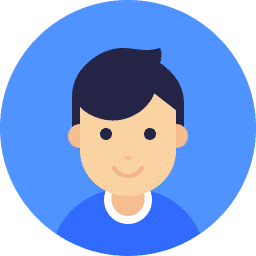 Enjoy industry-standard encryption, Kill Switch, and DNS Leak protection as well as 24/7 customer support with a Live Chat option. Remaining secure on the internet is of grave importance to all internet-savvy individuals. And while it may be somewhat of a new concept to install a VPN in your router, it is gaining traction and may soon be a must-have. If it means better protection and anonymity on the internet, we don’t see why not. 1 Why do you need a VPN for your Router?